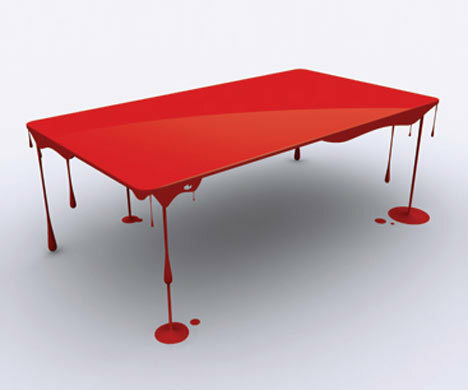 I love the concept of this table. It is just the paint - spilled paint no less. The table is missing and the result creates a humorous tension in the negative space. I don't have the room for this but I'd love to see it in end table or coffee table size. The bright red is perfect. If you are going to spill, it might as well stain. When I saw the blog post on Curbly highlighting the above table by John Nouanesing it joggled my memory of a plastic illusion side table I saw in person in an art gallery several years ago in NYC. It wasn't on display but was part of the gallery furniture. I have no memory of the art work on the walls but the table was firmly embedded in my memory. A little Google searching found it at Huset, a Scandinavian Design site. It too is missing the table. 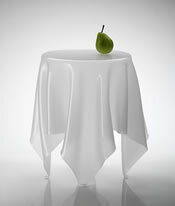 It is available in in both clear and white acrylic and known as the Essey Illusion Side Table. Definitely on my wish list.